There’s sibling rivalry … and then there’s crosstown sibling rivalry. Come September, Addison Arnold will be a Trojan while his twin, Anaya, will become a Bruin. But no “House Divided” flag will ever wave over the South Central L.A. family home. The twins refuse to let school pride come between them. “We’ll help each other out,” Anaya vowed. 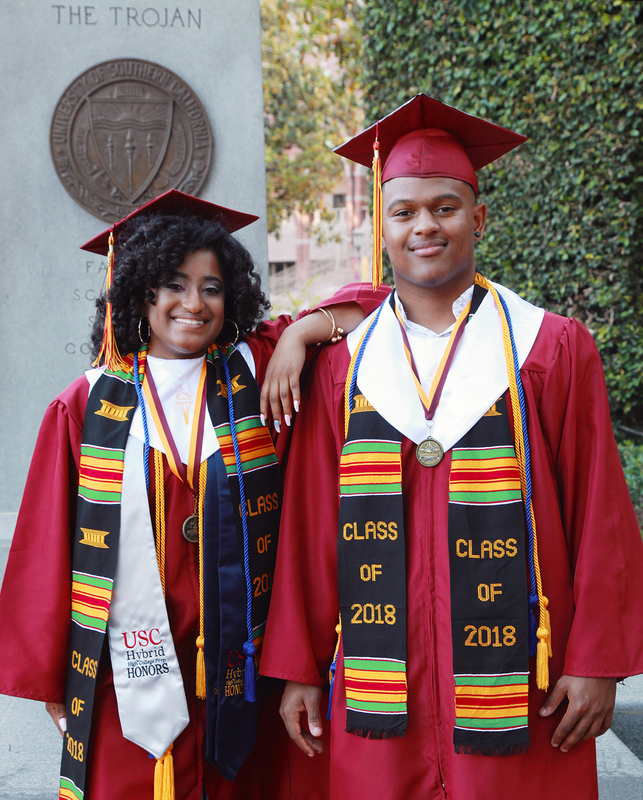 The spirit of “positive multigenerational change” — the driving force behind USC Hybrid High School College Prep — runs strong in the Arnold twins, who graduated from the school in a ceremony at USC this month. 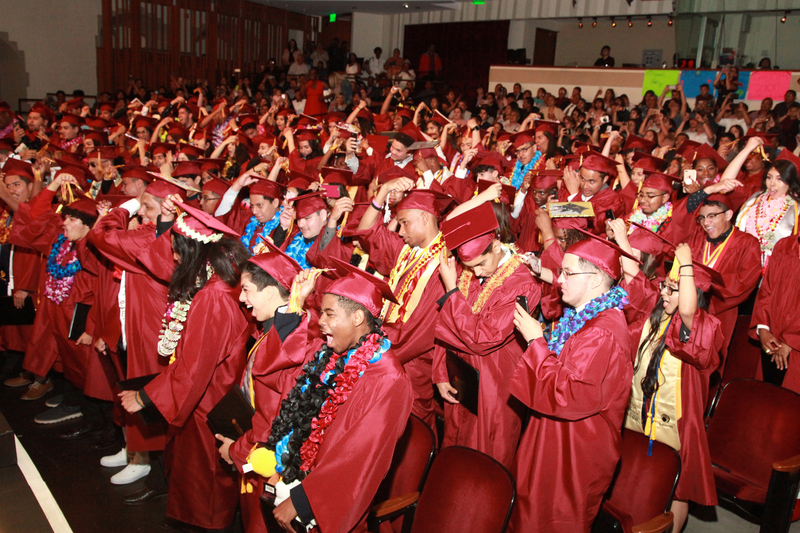 Founded in 2012 by the USC Rossier School of Education, the fast-rising charter school graduated its third class on June 9. With $3.2 million in confirmed first-year grants and scholarships, all 118 seniors from the Class of 2018 are college-bound, matching the 100 percent graduation rate and college acceptance rate of the first two USC Hybrid High senior classes. Most of the graduates come from low-income families, and many will also be first-generation college students. Addressing the graduates, Maria Ott, a professor of clinical education at USC Rossier and a board member of Ednovate — the charter management organization founded by USC Rossier to oversee USC Hybrid High and four other schools — told them that no accomplishment was out of reach. Valedictorian Aléjandra Ruelas spoke about her family. Mom had left school after sixth grade in Mexico, and her dad had dropped out of high school to work. “I’m often reminded of my privilege in having access to a better education,” Ruelas said. “This is why I am up on this podium.” She has held the top GPA in her class for four straight years, and she plans to attend the University of California, Berkeley in the fall. According to director of college counseling Takirah Crenshaw, two-thirds of the Class of 2018 chose to attend California public universities, and one-fifth will go to California community colleges. While all USC Hybrid High graduates were admitted to four-year colleges this year, 25 have opted to begin their undergraduate studies at a two-year institution. Fifteen others will go to private universities, including Vassar, New York Univeristy, Loyola Marymount University and Tuskegee College. And three students will be coming to USC, joining seven 2017 graduates and five graduates from 2016. Delcia Samuels, the mother of Addison and Anaya, wasn’t prepared for the flood of emotions triggered by the ceremony. The twins, she explained, had been born more than three months early, each with a birthweight under 2 pounds. They spent their first three months of life in a neonatal unit, and it wasn’t a sure thing that they would survive, let alone grow into healthy, accomplished honors students. Addison will study neuroscience at the USC Dornsife College of Letters, Arts and Sciences, and Anaya will pursue biology at UCLA. Both hope to be physicians someday. Emotions ran deep elsewhere, too. Eyes gleaming, a jubilant Mary Salazar, the class salutatorian, clasped her bouquet of red roses and diploma as family members huddled for photos after the ceremony. The child of Salvadoran immigrants, Salazar was active in many community service organizations throughout high school. She received five college admission offers and almost $82,000 in total grants and scholarships toward freshman year. For graduate Dinajreeah Morrah, reality hadn’t quite sunk in.